Are new surveillance technologies effective and legal? Controversial new technologies are transforming how police pursue suspects, monitor suspicious activity and seek to deter crime. Police departments are using computer algorithms to forecast where and when crimes might occur, sophisticated software to monitor social media posts, body cameras to record interactions with civilians, aerial drones to surveil neighborhoods and license-plate readers to find stolen cars and track criminal suspects. 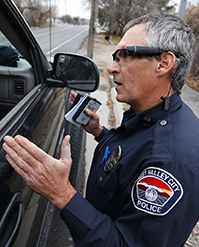 Law enforcement officials vigorously defend the technologies' overall effectiveness. But civil liberties groups say such tools raises troubling constitutional and privacy questions and that some police departments are using them without public notice, clear rules or proper oversight. While some cities have restricted the use of certain surveillance methods, others are under pressure to allow the public a greater say in formulating policies governing the technologies' use. Police maintain they are deploying high-tech equipment without violating individuals' rights and that opening its use to public review would play into the hands of criminals and terrorists.